One of the interesting things about being a Sheffield Wedding Photographer is the variety of different types of photographs we as wedding Photographers are required to take. Photographing a wedding these days isn't like it was when our parents got married, a few (perhaps a dozen) formal pictures in front of the church and that's it, today wedding photography requires us to have skills in many different types of photography. There is the obvious portrait photography for the Bride once ready in her pretty gown, the happy couple together for their photographs but also many other types of photography. We are expected to embrace landscape photography with our subjects in the scene, architectural photography both inside and outside the buildings on the wedding day. In this image we need to be able to photograph small details such as the Brides Engagement Ring as well as items like the wedding dress, shoes, bridesmaids dresses and flowers. These are all things that have been carefully chosen and have had to be paid for and it is our job on the Wedding Day to record all these to help remember the day by. 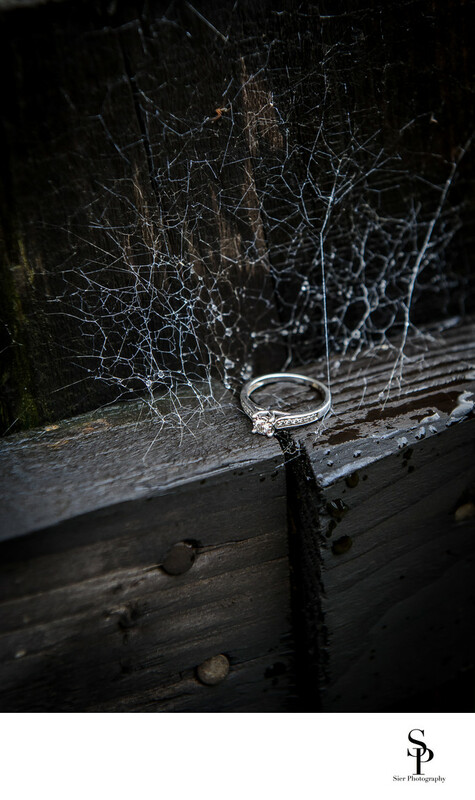 The ring in this picture was contrasted against the very dark wood of the fence and the cobwebs glistening with dew droplets make for an interesting contrast to this collection of Wedding Day images. 1/320; f/4.5; ISO 2200; 70.0 mm.